I have had a few inquiries about ceiling spotlights recently and one of my customers has successfully installed them in a modern art gallery shop box to display her miniature paintings so I thought it was the ideal opportunity to do a quick tutorial to show how easy and effective they are! Firstly, this is the interior of Hazel's finished room box. She wanted to create a modern art gallery that was well lit with even lighting which would show her paintings to best effect. I suggested using 3mm high brightness LEDs with clear lens clips which hold the LED in place and also act as a diffuser, spreading the light and making it very even (Standard round top LEDs normally produce a spotlight effect). 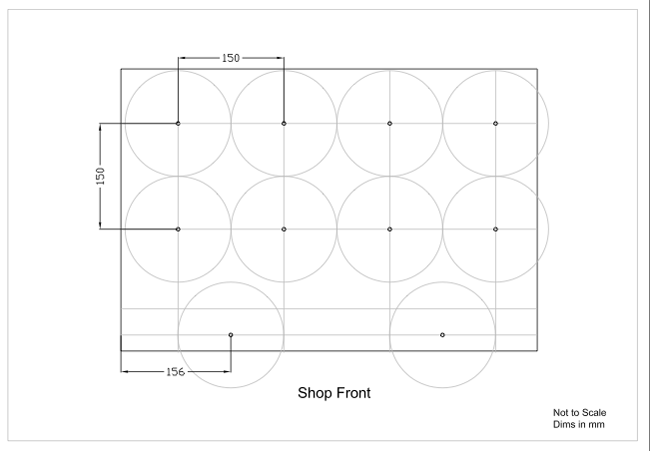 Based on her requirements I did a couple of tests with a cardboard box of similar size to her room box and that gave a light spread of about 3 inches per LED meaning they can be spaced at 6 inch centers (150mm) to provide even lighting. I drew up the plan below in CAD. It shows the LEDs at 6 inch centers (150mm) and Hazel also wanted three additional LEDs for the shop windows and the front door. 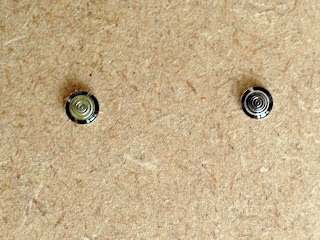 For the clear lens clips the best way to install them is to mark out your layout on the exterior of your room or room box and then drill 4.5mm holes at each location. Depending on your room or box you can either make grooves for the wires using a dremel, or by hand. You can then secure the LED and wires in place with masking tape over the top or, if you don't want to make grooves you can just stick the wires down with masking tape and cover with your flooring or roof material the same as you would usually do with lighting wires. The clips are designed for 3mm thick material but this can be worked around by drilling a slightly larger hole (ie 4.5mm) and if necessary, the clips can be glued in position with tacky wax or superglue or similar. Just a tiny drop in the hole to secure. I find the clear clips tend to hole pretty firmly though without glue. Once the clear clips are in position you simply push the LED into the clip until you hear a 'click'. It's best to have one finger on the 'spotlight' so the clip doesn't get pushed out of the hole. Once the LEDs and wiring are installed you can connect them up to your power supply. In this case all the LEDs are powered off a 3 volt, 2 x AAA battery kit. The 3 LEDs in the shop frontage were powered off a separate 2 x AAA battery kit so the front can be easily removed. A small connector block was used to connect the LED wires to the battery wires. It ensures a good connection and makes wiring very simple. No soldering required. This makes it a very effective but simple solution and ideal for portability. This was a very large room box - the Victorian Shop Box kit from the Dolls House Builder which is 23" L x 16" W x 12" H (590 x 400 x 298mm) which is a huge shop! The entire spotlight kit including 11 pre-wired LEDs, 11 clear lens clips and 2 AAA battery kits only cost £30 so it's a fairly cost effective solution. 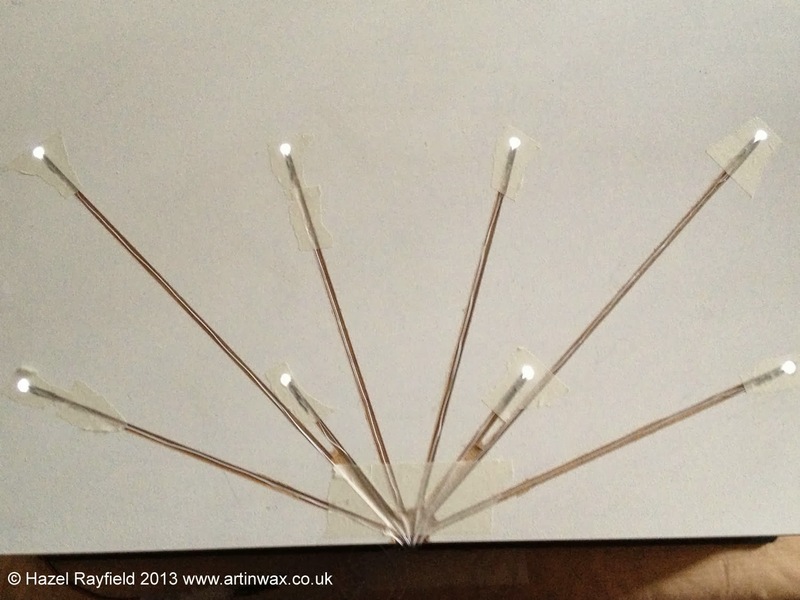 The LEDs were wired with the white wire found in all dolls house lighting which has the advantage of being flat and so very neat to hide but it is slightly more expensive than the standard red & black wire I can also supply. Other clip options include black ring clips or brass or nickel metal 3mm eyelets. Top row shows each clip with a 3mm LED installed. Lower row is the clips on their own. 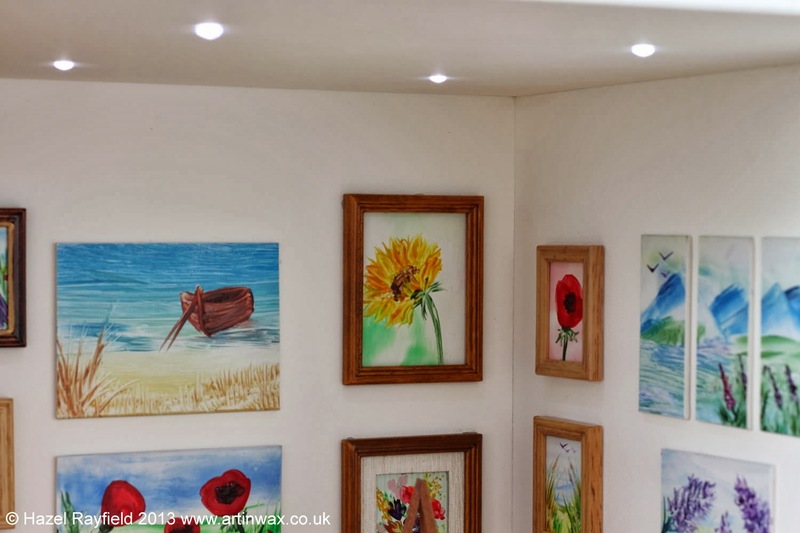 If you'd like to read more about the creation of Hazel's Art Gallery with lots of finished photos including the shop frontage, click on the link: Hazel Rayfields Art in Wax Blog. 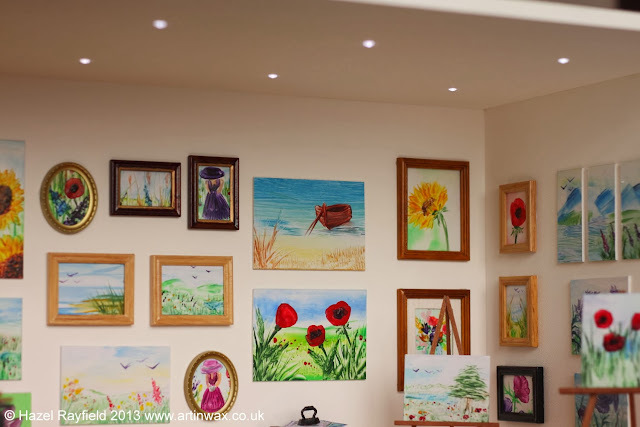 I'd like to thank Hazel for allowing me to use the photos of her finished art gallery. I hope it's a useful tutorial and perhaps inspires you to try something similar. 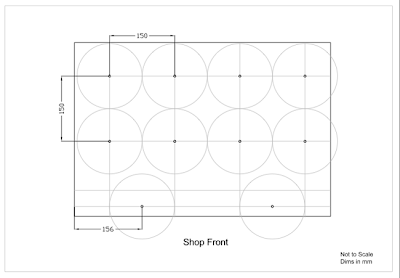 There are three options to suit different sizes of project or room. This tutorial is for personal use only and must not be made for sale or commercial purposes. All text and photos copyright of JS Miniatures. I have updated the post with the links to the LEDs and clear lens clips. The LEDs are pre-wired single LEDs. Hi, if I want to connect the LEDs to the dolls house 12v wiring system would each spotlight need it's own separate plug? Hi elbey, The LEDs all have their own resistor so there would be no problem wiring them into one plug. It would work in the same way as if you were using a battery. If you wanted to do it this way I would provide a connector block. 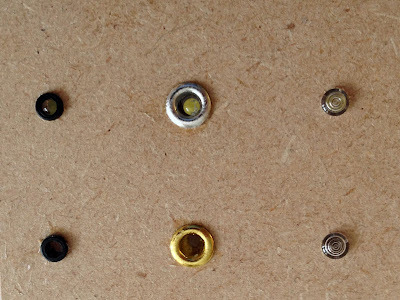 You would then insert all the LEDs into the connector block and take a small additional piece of wire from the connector block to your plug. Each light would count towards the number running from one transformer but LEDs are lower amps than filament bulbs so we'd have to check the amps of the transformer and work it out if you were worried about it. It would also need to be a regulated transformer (which most modern ones are) as unregulated transformers can have power spikes which could fry the LEDs.